(Newser) – Kendrick Lamar won the Pulitzer Prize for music Monday, making history as the first non-classical or jazz artist to win the prestigious prize, the AP reports. The revered rapper is also the most commercially successful musician to receive the award, usually reserved for critically acclaimed classical acts who don't live on the pop charts. 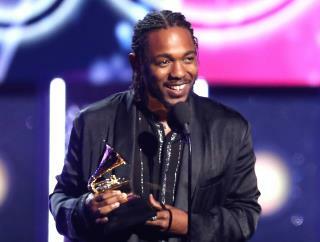 The 30-year-old won the prize for DAMN., his raw and powerful Grammy-winning album. The Pulitzer board said Monday the album is "a virtuosic song collection unified by its vernacular authenticity and rhythmic dynamism that offers affecting vignettes capturing the complexity of modern African-American life." He will win $15,000. Lamar, who has won 12 Grammys, has been lauded for his deep lyrical content, politically charged live performances, and his profound mix of hip-hop, spoken word, jazz, soul, funk, poetry and African sounds. Since emerging on the music scene with the 2011 album Section.80, he has achieved the perfect mix of commercial appeal and critical respect. The Pulitzer board has awarded special honors to Bob Dylan, Duke Ellington, George Gershwin, Thelonious Monk, John Coltrane and Hank Williams, but a popular figure like Lamar has never won the prize for music. In 1997, Wynton Marsalis became the first jazz act to win the Pulitzer Prize for music. Other notable Pulitzers went to reporting on Roy Moore, Harvey Weinstein, and the Trump-Russia investigation. Then a couple of days weeks later Lamar got plugged by his own and took it to the pawn shop. Ohhh the wailing of sad old men and women over this ... they see the word rap and they still think it's all gangsta rap that went out 20 years ago. It's that tragic, old person's disease where they don't understand modern music so it must be evil. What an awful way to grow old.